Hello everyone! So finally we are home with internet...even if it is for only one day as our third and final summer adventure commences on Monday! Meanwhile I have some serious blogging catching up to do as it has been a real week off for me! But more on that in the next post! On Wednesday I turned over my weeks to 14 weeks pregnant and I'm really starting to feel it now! 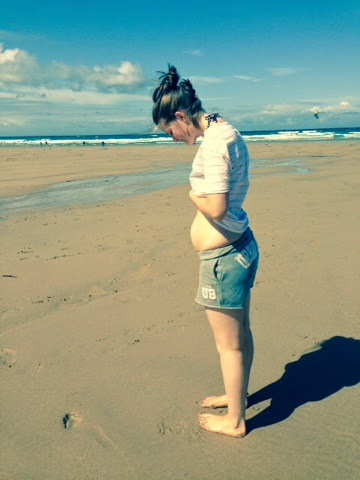 We have had a busy week of beach activities in Cornwall and, as my first time being pregnant on one of these holidays, I really felt the hard work of paddling out to bodyboard. Not to scare anyone, I remained very much in the shallows and only took the gentle waves, but after an hour each day I felt completely beaten! Such great fun though! How far along? I'm about 14 1/2 weeks now! Total weight gain/ measurements: As we have been away, I haven't measured or weighed myself, but I am feeling bigger this week. My clothes are feeling tighter and you should have seen how long it took to get my old wetsuit on in Cornwall! 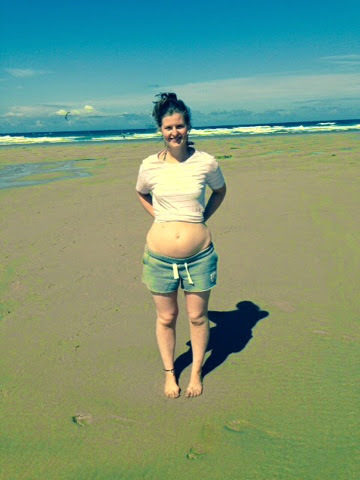 Maternity clothes: I did a first mini shop before Cornwall where I picked up some maternity skinny jeans and a couple of tops. My trousers and jeans are all getting rather uncomfortably tight now, so I thought it time to invest! Stretch marks: Nothing new to report! Sleep: We have been camping in a tent this week and so our usual sleep patterns have been a bit disturbed, especially with Noah rolling around between us! But apart from that I have been loving every moment of sleep and feeling pretty comfortable too. Best moment this week: I think just seeing how much fun Noah had in the rock pools with his little wet suit on. It was really lovely to be at the beach where Eddy and I already have so many memories, and then to bring our first child there felt really special! Miss anything? My bed! As much as I love camping, I'm so glad to have it back again tonight! Movement? I can't feel anything yet, but hopefully in the next couple of weeks I should be able to report the first 'ripples' of movement. Food Cravings? Yesterday I had a strange craving for Heinz bake beans mixed with tomatoe ketchup. I found myself sitting on the beach imagining a whole plate full! Weird, I know! Anything making you feel queasy or sick? Not really this week, the morning sickness has completely gone now so I am feeling a whole lot better! Symptoms: Just feeling a bit slower this week. I found it really hard work being in the sea this week which has never bothered me before. But I was just exhausted this time! My symptoms are much the same as last week, I think my belly is just beginning to really 'pop' now! Happy or moody most of the time? This week I have been so happy! We've been on holiday so my mood has been sky high! Looking forward to? More camping this week! More on that soon, but for now I'm going to enjoy a nice warm bath! Sorry again that this post is so late! As we are camping this week too, I will probably be very late posting my 15 week pregnancy blog, if it makes it up there at all! Things will settle back down after this coming week and the blog will be more consistant. Promise!